Even if you're aware that you should eat more fruits and vegetables, it can be difficult to make healthy diet choices when you're busy. Salad, for example, isn't as easy to eat as a hamburger when you're rushing to a meeting. A healthier choice is to take the ingredients in your salad and wrap them in a pita along with some hummus for protein. The calories in your veggie wrap depend on its specific ingredients. A whole-wheat pita that measures 6.5 inches in diameter has 170 calories, making it the highest-calorie element of your vegetable wrap. Two tablespoons of store-bought hummus add another 50 calories to the wrap. One cup of shredded iceberg lettuce has just 10 calories, while one-quarter of a small-sized red pepper adds just 6 more calories. One-quarter cup of grated carrots contributes 11 calories -- and half an avocado adds about 161 calories. 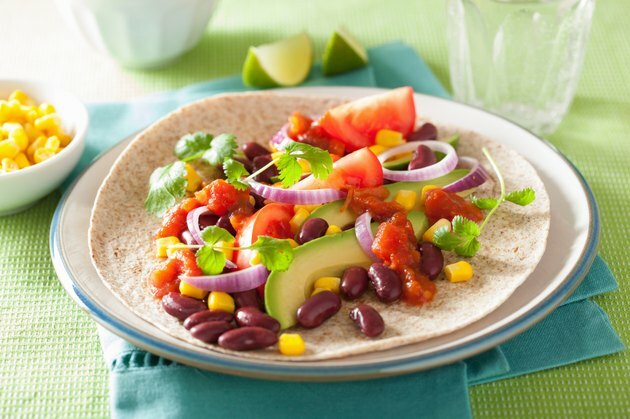 Given these ingredients, expect your vegetable wrap to have roughly 408 calories. To avoid the calories from the pita, wrap your vegetables in a large lettuce leaf. A large-sized lettuce iceberg leaf has just 2 calories.